Station Couriers offer flexible services at a competitive price in the UK, Europe and worldwide. We have a wide range of parcel services that we can offer you. Station Couriers offer competitive rates on overnight, timed and Saturday morning deliveries within the UK. We also offer free online tracking of your package so you can check on how your parcel is progressing through our system. Station Couriers are proud members of the APC Overnight Parcel Network. 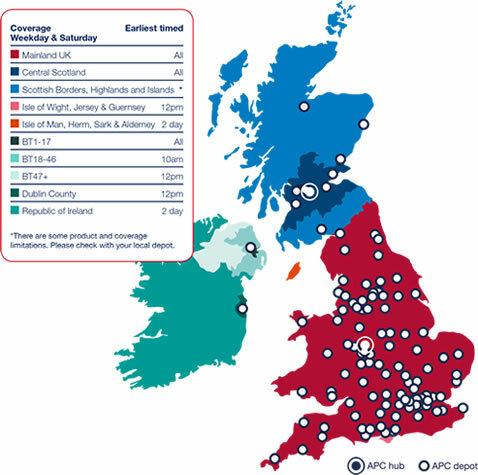 APC Overnight is the largest UK overnight delivery network with over 125 depots in the UK. We also offer a worldwide and full European road service. We are proud to be members of the APC Overnight Parcel network. APC Overnight is the largest UK overnight delivery network with over 125 UK depots. We also offer a worldwide and full European road service. Please contact us if you would like to know more about these services. You don’t need to regularly send parcels to be able to take advantage of our competitively priced service. If you don’t feel the need to open a credit account with us, simply pay for us to send your goods on a one-off basis. You can pay by cash, credit/debit card or bank transfer. However, the funds must be cleared before we can distribute your goods. If you would like more information on our parcel delivery service, or to get a quote, please call us on 01686 621 190.